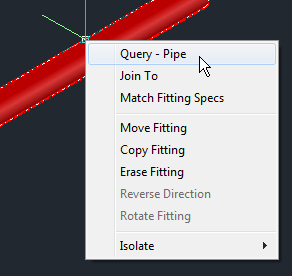 Cadpipe Right Click Menus have been added to all modeling modules. New Editing capabilities including: Reverse Fitting, Rotate Fitting. All Copper Wrot & Cast fitting dimensions have been checked. Created a blank System Spec’s database for setting up projects in the Control Center. Added Top and Bottom Elevation to the Tooltips. Double click query now works on Non-CADPIPE BOM Tag entities. New Wrapper command for rectangular and round fittings. New Editing capabilities including: Reverse Fitting, Rotate Fitting, and Change Schedule. Added unique variables for cut pipe lengths, bolt lengths and flange/valve bore to BOM and BOM Wizard. Added a dimensional database for hangers and supports. Hangers are automatically sized when items have insulation, no longer need to set insulation thickness in the hanger program. BOM reports bottom of fitting elevation.